Now Nash Even Hates California Traffic! We had a very nice lunch on Friday and then got back to the car around 2pm to begin the two hour drive back to L.A. from San Diego. We barely were on the 5 Freeway and the standstill began. I always thought the idea of a freeway was for cars to move and get somewhere not to be parked. It ended up taking us four and a half hours to get back to L.A. Unbelievable. Even Nash was frustrated. Well, we finally got back to Steve’s, and it was seven oclock, we were literally sitting on the couch for ten minutes when we realized that we had nothing in the apartment for dinner. Ugh, so Steve, Nash, and I got back into the car to run over to Trader Joes to pick up some food. Nash did not want to get back into the car, he was looking at us like, seriously dude? We finally got him into the back of the car, and we are on the road for a few minutes, when we hear the back window crack a little. I asked Steve if that was him, and he was like, I think Nash did it. Steve rolled the window back up, then we hear the window roll all the way down. We were both in hysterics laughing. I guess this was Nash’s way of saying enough of all this being in the car. What a smart guy my little Nasher is. By now, I am thinking about calling Guiness to see if Nash and I have set some kind of record for the amount of travel by a guide dog and his handler in a two week period. Weds. we relaxed in L.A. We did nothing and it was everything we thought it could be. Wish I could take credit for that line, but it is a line from the movie Office Space. Thursday, Steve and I ran some errands, and then it was time to pack to head back to San Diego for the second launch of VisionZone at the CSUN conference for technology for people with disabilities. Oh by the way, did I fail to mention that through all of this, my good friend Steve has been a little busy with a new engagement, getting ready to move back to New Jersey after living in L.A. for 17 years, and buying a house, so putting the blind guy up and Nash, driving him around L.A., cooking for him, and getting ready to head down to San Diego with him tells you what kind of guy he is, the best. Steve packed up the car, we got the Nashster all nice and comfy, and began the trek down for our dinner meeting with Andre and Kelly of Optelec. We got fairly fortunate, as we did not hit to much of the L.A. traffic, as it only took us three hours to get to San Diego which believe me, is pretty good, but we did have a dinner meeting, so we had to rush to check into the hotel, get cleaned up, feed Nashie, and then pp in to a cab to meet up. I wish I could remember the name of the restaurant, as the Mexican place we were meeting at is my favorite in San Diego, as they have over two hundred kinds of tequile, but more importantly, they have some of the best shrimp tacos I have ever had. What I do know is the restaurant is on the corner of 8th and J streets, so if you are in San Diego you have to go there. Dinner was fantastic and very productive, as we talked about VisionZone, the premiere, and some future things we have in the works which I will talk about at a later time. Steve, Nashee, and I then headed out to a few bars in the Gaslamp area of San Diego, because afterall, how often are you in San Diego? Well, a lot lately, but who knows when I will be back again. If you have not been to downtown San Diego, it is one of the cleanest and nicest cities in the country. San Diego has actually now made my very small list of cities that I would consider living in, and more importantly, Nashee loves it and all the different smells that you don’t get in NYC. We got back to the hotel, the Manchester Hyatt, and had to sleep fast because the next day Nash and I had to be at the conference to meet and greet people as the VisionZone short film played on a loop in the background. Nash and I headed downstairs, and Steve packed us up. We thought we were going to be in San Diego for two days, but as things ended up, we were only needed for the morning. Nash and I got to the show room, and the conference from fairly empty. I asked Kelly what was going on, as there were over 300 exhibitors at the show. She laughed, and said, have you been outside yet. It was so amazingly gorgeous out, no matter where you were from and what you were in San Diego to do, you would have to have your head checked to want to be inside. Kelly was kind enough to throw us an audible, and say there’s really no reason for you guys to not go and enjoy the day. And with that, we were done. Time to grab a bite, and enjoy a little more of San Diego before heading back to L.A. Steve, Nash, and I went out to lunch over by the water. 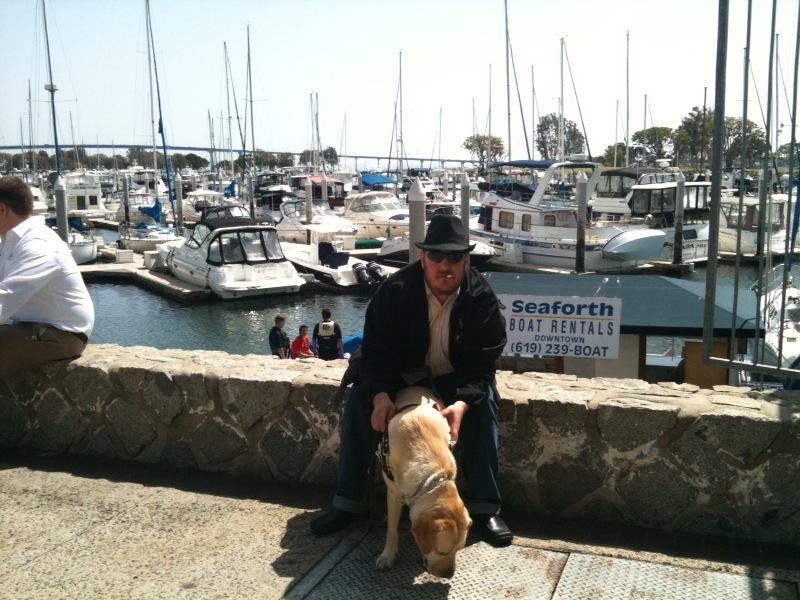 Here’s a picture of Nash and me really chillin in San Diego, and yeah, that is the new hat that I blogged about. No rest for the wicked. We were up bright and early last Monday, as Scott, the Nashster, and I were heading up to Los Angeles. We had to leave San Diego before 11am, as the 5 freeway can turn into the worlds largest parking lot later in the day, and almost does so on a daily basis. We stopped for some last minute Mexican food before heading off, as the food is amazing in San Diego. We made great time back to L.A., a little over two hours. We stopped off for lunch at a bar called the Village Idiot, but I just had some water as the Mexican food was performing some tricks in my stomach. We had to hang out for a little, as my Steve that I was going to be staying with was out on a job, and wouldn’t be home for a few hours. Due to this, I had to break my personal rule of doing my business in a public restroom. Amazingly, I cannot even recall the last time I did, as I think it has been about ten years. Yeah, I know that was more info than you needed, but an impressive streak had ended. After I was feeling much better, we walked around the Melrose area. Of course, its L.A., so it was a beautful day, but with my severe light sensitivity issues, it was a little to bright out for me, even with the shades on. I ended up getting a 1940s bolo hat, or at least, I think that it is what it is called. If you watch the show White Collar which you should, it is like the hats that the main character Neal Cafferty wears. I figured it would look great on stage. We then headed over to Fred Segals to hang out down the street and wait for Steve to get home, and had a few glasses of wine at their wine bar. We walked back to Steve’s, hey, I thought nobody walked in L.A., at least that is what the song says. I guess I forgot to tell Steve that I had a show, becuase he thought we were just going to hang. We had to rush over to the Ramada to get there in time. Oh boy, a whole ten people at the show, this is going to be fun. Now dont get me wrong, a show can be great with only ten people, but not if it was these ten midwesterners staying at the Ramada who seemed to not know how to laugh. Every comedian was dying on stage, oh boy, I cant wait for my turn. I didn’t fair much better with this crowd. What are the odds, a blind comedian, and a deaf audience! We got out of there fairly quickly after my set, as I have never seen Nash this tired, and I wasnt far behind. 9 cities in 7 days will do that to ya. We picked up some grub headed back to Steve’s for some tuve time, and hit the sack. It was a good night sleep, no ambien needed. Tuesday, we got some well deserved R and R, and we ran some errands. Steve is an amazing cook, so we picked up a bunch of stuff for the week, as I dont get home cooked meals too often. At night, we headed over to the Improv for my show. I new this would be a lot better than the previous night, and even wore my new super cool hat. I had a great set, and had a lot of fun. Nash was great on stage, and much more well rested. Afterwards, we hung out at the bar at the Improv on Melrose, and talked to a bunch of people. Now why can’t every show go like this. The VisionZone VIP Premiere and Party! Sunday Nash and I were in San Diego for the premiere of the short film we shot in January, VisionZone – You’re Not Alone Anymore. Optelec the global leader in the manufacturing and distribution of technological tools for people with low vision has launched a new company called VisionZone, although the film has not been released on the website, youcan go to the website at visionzone.org. Visionzone (VZ) is a remarkable venture for people living with low vision, as the new site offers advice for people with low vision in all walks of life, has doctors contributing expert advice, blogs, and most importantly a facebook type social network for people living with low vision, family, and friends to network and connect. VZ is just starting out, so the more people contribute the better the site will become. This has been a massive venture for Optelec to undertake, for as they are a company in business to make money, this new venture is about spreading awareness and helping people connect. Something that many of us in the visually impaired world have been complaining has been lacking for years. Scott, Nash and I spent the day relaxing, and since we were in San Diego, I had to get me some shrimp tacos for lunch, sorry Nashee, nothing but lamb and rice for you. After a late lunch, we began getting ready for the big premiere. We headed over to the premiere with the director Drew Antzis and his wife Tamara. When we got there, some of the employees from Optelec were milling around. They had their big yearly sales meeting, but had not seen the film yet. They were expecting over 250 people, and had rented out a upscale club called Anthology. There was a little red carpet out from, and all of us from the film had a bunch of pictures taken, and even though Nash had nothing to do with the film, he was in the pictures. I will get some of them up as soon as I get them. We then headed inside for a cocktail hour before the screening of the film. I spoke with a bunch of their reps, including my dealer Chuck from NYC who I have purchased a bunch of low vision technological tools from. I also spoke with a rep from Ohio who had actually been to one of my shows in NYC, small world. Then it was time for the screening, but first a few people from Optelec said some words about the company, the screening, and the plans for visionzone.org. Then came the screening of the six and a half minute film. It was a smashing success, funny, touching, and educational, and who knew I could act! After the screening, Drew and I both gave short speeches, then the whirlwind began. I am used to be grabbed in a million different directions at Laugh For Sight, so this was nothing new. I spoke to so many people, I dont remember who was who, hut there were a lots of pats on the back, and congrats, and hey afterall, everyone wants to talk to the star? Hey, when do I get to get my ego? Kidding, the whole evening was a blast, and I think Nash was like, hey I’m the real star, I just don’t do short films! Saturday morning Sir Nash a Lot and I said our goodbyes to the parents and headed to San Diego. Another blind advantage, your parents can go through security with you and wait with you at the gate. We were flying out of Miami as that was the only way to get to San Diego without having to head back to NYC, pretty strange, I know. Our flight was actually leaving early, hey, this is a nice change. Uh oh were leaving early because there is a big storm rolling into Houston, and that is where we are connecting to get to San Diego. Our lucky streak of sitting next to people on planes that love dogs continued which was great because Nash does like to stretch out on the plane and take up a lot of other peoples space. The plane ride was a little bumpy, and we were flying Continental instead of my preferred JetBlue. Amazing how much friendlier the crew is on Jetblue, as none of the flight attendants even talked to me. Most importantly we arrived alive and on time. This was Nash and my first time in the Houston airport. Wow, the staff at the airport was nice. Nash and I caught a ride in one of those airport carts, as we had enough of a layover for us to go outside, and for him to go to the bathroom. It was raining and a little cool in Houston, so this is Houston, Nash got to pee. Nice time in Houston, and that is really all I can say about Houston. The storm rolled in and out, and we only left Houston a few minutes late. The flight from Houston to San Diego was the emptiest flight I have ever been on. Nash had the entire bulkhead to spread out in. Better not get used to the Nash. Again, none of the continental crew even talked to us. Not the friendliest people in the world. We got to San Diego, and there was no one there to meet us at the gate and walk us to baggage claim. Another bad mark for traveling on Continental, as Jetblue always has someone at the gate to meet and help. I had to wait for the entire plane to empty, and for the crew to come out for them to call someone to help us. What a surprise we got to baggage claim, no one left there, and I think my bag was the only bag sitting there. Luckily the guy helping me walked me out to a cab, and we headed off to the Hampton Inn in San Diego. My good friend Scott was coming down from L.A. to hang out, and he was already at the hotel and was waiting outside. I got checked in, and we headed up to the room. Surprisingly, there was no restaurant in the hotel. I called Kelly from Optelec to touch base, and while on the phone with her, heard the ungodly loud sound of a train coming right by the hotel. To quote the movie the Blues Brothers, “how often does that train come by? So often you wont even notice!” You’ve got to be kidding me. Scott and I headed out to get a bite to eat and grab a few drinks. The Hampton Inn was right by the Little Italy section of San Diego. It was nice, but definitely no Mulberry street. We did have a good time at the bars we went to, and talked to a few people. We didn’t stay out to late, as Nash and I were exhausted. Now back to the hotel with the train that comes by, how in the world is the Hampton Inn still in business, this should be a fun night of sleep. On Friday, the Blindman Cometh made its triumphant return to the New York Comedy Club in Boca. We spent the day running errands and recovering from a stomach ache. Thursday night, Nash and I met up with a bunch of people that I went to high school with in our old stomping grounds of Coral Springs. It was great catching up with some people that I never imagined I would see again, but thanks to Facebook, I have reconnected with about 160 people from high school. My good friend Greg Moon who I went to college with, was best man at his wedding, and I am Godfather to his daughter also came to meet us. It was a lot of fun. Its strange, as I have opened for some of the biggest comedians in the world, including Kevin James and Ray Romao, and Friday night, I had my parents, some of their friends who I have known since I was a kid, and about 30 people I grew up with come to the show, and it was the most nervous I have been before a show. I was really amazed at how many people actually showed up, as like anything, people always say they are coming to a show, but then things come up. I thought that I had a really great set, the crowd loved almost all of my material. I even spoke with the coowner of the club, and she is real interested in hosting a Laugh For Sight Florida, but that is something I will go into at a later time. Stephanie also wants Nash and me back anytime we are in Florida, and that is the best you can ask for after a show. A bunch of friends and I went out for drinks after the show. We went to the Boca Ale House, and got to catch up a little. We were out to about two am which was a little late considering we had a plane to catch the next morning. Overall the night went better than I could have asked for, and it was a lot of fun performing in front of all the family and friends. Nash was also really well behaved on stage, although I was told he was starring at people’s food in the front row. Hey, hes a dog, what do you expect, at least he didnt lunge at anybody. Nash and I headed down to SoFlo for his first visit to the parents, and my first trek down there in 3 1/2 years. People have asked me why I haven’t been down there in so long? Forget the fact that it is ridiculously overpriced to take a cab to the airport, wait until you hear what happened. Nash and I get to LaGuardia in good time, he does his last business, and we head to security. JetBlue has someone assist me to the gate, and we get to cut the line to go through security, hey you have to take the blind advantages when you can. I’ll tell ya what, I’ll trade ya, and you can have the blindness, and I’ll take the wait in the line. Anyway, we get through security and to the gate, only to learn that the flight is going to be delayed an hour. Fortunately, it was only backed up an hour, as all flights are still delayed from the previous two days of bad weather. Nash and I get on to the plane, and we are already to get going. They get the whole plane boarded, and you know how much time that takes when you are going to West Palm! So we’re sitting on the plane, and then the power goes off . Ends up the plane is dama. ged, and they are not sure if it could fly. Always something you love hearing especially when you are not a big fan of flying to begin with. They are going to run some tests on the plane to see if it is flyable. I wasnt sure that I wanted to stay on the plane even if it was flyable. Well, it ends up the plane was to damaged to fly. Amazingly, they had another plane sitting bye that we could take, so the fun began of deboarding the entire plane. Jill the flight attendant was fantastic, and looked into a grounds crew guy walking Nash, but of course, this was not possible, as it was a security issue, but hey, at least they tried. I waited on the plane until everybody was off, and Jill walked Nash and me over to the new plane. While heading over she asked, “is someone picking you up in West Palm?” I said, “yes,” and Jill said, “good then you can have a drink on the plane!” I said Jill, “even iif no one was picking me up, its not like I am going to be driving!” Jill started laughing, as she realized her goof. Nash and I got to board the plane with the crew, and believe it or not, the entire delay wasnt to bad, as the flight crew was so great and friendly. During the flight, Jill came up and asked if I wanted something to drink, and I told her I would have a diet coke, and she asked do you want anything in that, and I said oh yeah, Jack and Diet Coke. As Jill went to place the beverage down, I said, “thanks a lot Jill, ten years of sobriety down the drain!” She freaked and pulled the drink back, then I told her I was just kidding, and she gave me my drink. It was a fun flight, and of course Nash was on his best behavior, and quite comfortable sitting in the bulkhead. My parents were at security to greet Nash and me, and they were quite thrilled to see us, and have us in Florida. It took us ten hours to get door to door, so reason number one why we have not been to SoFlo in 3 1/2 years is the travel time. It was midnight when we got to the parents, Nash got accustomed to their house very quickly, and immediately jumped into the bed we would be sleeping in. Tuesday was a day to relax and get some things done. Nash, my dad and I went for a walk to get the Nashster some exercise. Then Wednesday came, and Nash got to go to his first funeral. My parents good friends father passed away, so we were in Florida for a little more than a day, and we had a funeral to go to. I dont know what it is with Florida, but people seem to die down there a lot. Then again, he was 94, Reason number 2 we hadnt been to Florida, people die. Nash was a huge hit at the shiva call, and very comforting to everyone. So what did we have planned for Thursday in Florida? I got to go to the dentist which I had not done in about five years, so you can imagine how much fun that was. Wow, what a fun few first days in Florida! Nash must really like me, as he had a rough day yesterday. First, I was putting money into my wallet, and I went over to the light by my bed, and I wasn’t paying attention, as I was trying to figure out what each bill was to put them in order, and as I was doing this, I was thinking and I sat down on my bed, and I sat right on top of a sleeping Nash. It startled me probably more than him, as I jumped up, and immediately started apologizing to him. Nash just stood up on the bed, shook himself awake, sat back down on the bed, and gave me a look as if to say, seriously dude, you sat on me, you know I am always in your bed. At least he didn’t jump out of the bed startled. Then last night, I was laying on the couch watching tv and as I grabbed the tivo remote, I dropped it on him. He didn’t even budge. He was probably thinking, well, at least he didn’t sit on me. Flash Forward a day to tonight, Nash was annoyed at me because I had my suitcase on my bed as I was packing it. He kept looking for ways to get into my bed, or as Nash calls it, his bed. I think Nash may have a case of attachment disorder because as I was packing, he was following me all around the apartment. I kept telling him, yes, you are going with me. When I fold shirts, for some reason, I have to put them on a flat surface, so I use the floor, and as I attempted to fold the first long sleeve shirt, Nash walked and stood right on top of it, as if to say, if you aren’t giving me your bed, I will make packing tough on you. Either that, or he was getting back at me for sitting on him yesterday. Take you pick. Of course, as soon as I finished packing, took the suitcase out of the bed, I hear the Nash leap into my bed, and now he is all curled up in my bed, I mean his bed that used to be my bed. Next blog from Florida. The Blindman Cometh returns to South Florida with a Four Legged Furry Sidekick! Sorry for the lack of blogging this past week, but we have been quite busy with preparing and drafting our fantasy baseball teams. Hey, this is important stuff, as it leads to six months of fun, and yes, I am addicted to it, and since I can’t play baseball anymore, it has become my hobby. I have gotten to that age where even if they cure me of my blindness, I will be to old to make it to the majors, unless of course, I come back as a knuckleball pitcher, so maybe I should start learning how to throw one. Hey, you always have to prepare for the future. I have also been quite busy as Nash and I are getting ready to head out on the road for about three weeks. Oh, you didn’t think I was spending all of my time on fantasy baseball? We have an exciting few weeks coming up. And not to worry, while I haven’t been blogging, Nash and I still have gotten our walks in, and plenty of play time. Nash even let me use him as pillow for a little bit, which I do quite enjoy. Now, on to the exciting stuff, but first, let me go check the status of my fantasy baseball draft. On Monday, Nash and I will head to SoFlo to see my parents. I think it is my first trip down there in three or four years. I used to go about three times a year, but hey, the economy has sucked, and with little Sienna around now, they have come up here a lot more. Nash has a lot of people that can’t wait to meet him, as he has a big SoFlo fan club. No one really wants to see me, they just want to meet the Nasher. Hey, I have gotten used to it. Unfortunately, we will be there for less then a week, but we will be back at New York Comedy Club in Boca Raton on Friday, March 19th, If you are one of my Florida readers, and you are looking to get tickets for the show, you can call the club at 561-470-6887. It is the 9pm show, and I believe the show is called Irish Comedy Weekend. Yes, I know, I am not Irish, and i do have a great bit about it, but can’t reveal it, as I will be using it. It will be a pressure packed show, as I have a lot of people I grew up with, friends from college, and my parents friends coming to the show. Believe it or not, but the most nerve rattling show I ever had was in Orlando in front of a bunch of friends I grew up with during a mini reunion weekend. Yes, that’s right, I was more nervouse before that show then I was when I opened for Kevin James and Ray Romano. Go figure. Unfortunately, we will leave Florida the next more, as we will be heading back to San Diego, as the short film I shot, the VisionZone for Optelec will be having its VIP Premiere on Sunday the 21st. I have been to plenty of premieres during my Hollywood days, but never one that I starred in. I will also be giving a speech before the screening. Should I start it with, I would like to thank the academy? If you read down, we are mentioned in the article, actually me, no we, sorry Nash, but you were not in the film, but were on set. Hey, it can’t always be about him. Then after the launch, we will head back to L.A. for some more shows and meetings, so you can see it will be quite a few busy weeks, and should be fun. Nash will become quite the traveler, and now you can see why I had to get my fantasy baseball drafts out of the way. You are currently browsing the Blindgator's Weblog blog archives for March, 2010.